Though i have few guests in the past few weeks, i couldn't take pictures in a hurry. Two weeks back when i have my friends family for dinner i made this for them. One of my friend has her parents from India for Navaratri. Since they won't take onion and garlic during this time, i made this menu for them. Since it a small get together of 10 people i tried my hands on kozhukattai for all. They enjoyed the menu a lot and we all had a very good time. Just a little planning in advance, you can make this easily. 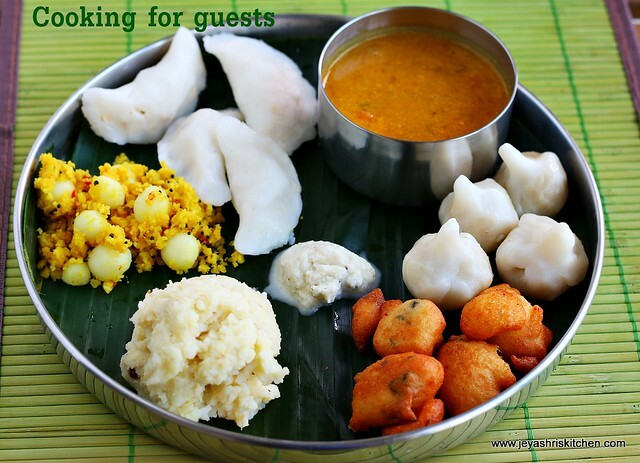 Check out my cooking for guests series . For the dessert i made a creamy fruit salad, which was not in the picture but i will post it here soon. Among the entire menu, the vellai appam and the fruit sald(dessert) was a super hit. 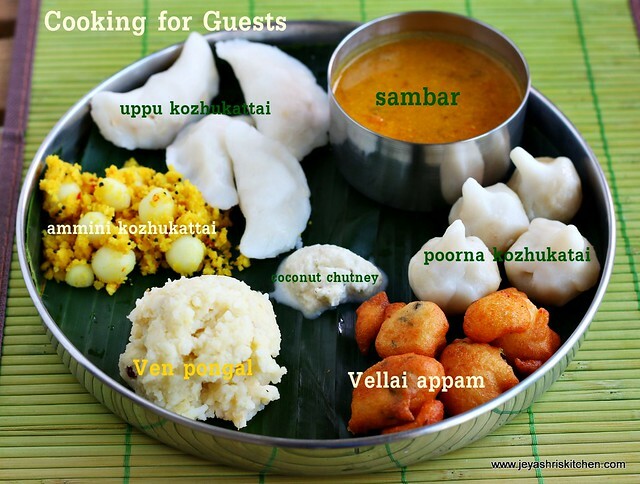 They all enjoyed the traditional kozhakattai platter. For the thengai poornam kozhukattai i made the poornam before night and kept it in the fridge. I used the store bought idiyappam flour for the kozhukattai. Soak the dals for the poornam kozhukattai in the morning. Also soak for the vellaiappam in the morning too. After 3-4 hours grind the one by one and keep the poornam ready for ulundu kozhukattai and ammini kozhukattai. Keep the batter of vellaiappam inside the refrigerator. I asked help from kids and hubby for making the small balls for ammini kozhukattai. They all happily did. So feel free to take the help from the family members. First i made the ammini kozhukattais and kept it ready. Then i started making modakkam. It took 1 hour for me to make 45 modakams. Once it is done, i made the dough for ulundu kozhukattai cover. In the meanwhile i kept dal for the sambar in the pressure cooker. Ulundu kozhukattai took more time for me as i did it bit more. By the time i finished making the last batch of the kozhukattai, kept the pongal in cooker and started making the sambar. Chutney i made it in the noon and kept in side the fridge. Just before the guests are about to come i made seasoning for pongal. The fruit sald i made the previous night and kept inside the fridge. It will be nice when chilled. The Vellaiappams i made just before serving. 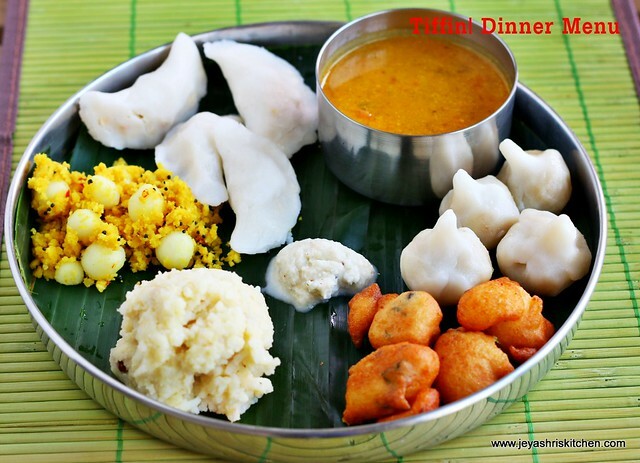 Instead of making poornam ammini kozhukattai you can make check my other version of ammini kozhukattai with molagapodi.